What: A rivalry renews as the Danger visit the Blizzard. When: Friday, March 1 at 5:05 p.m. pacific (7:05 p.m. central). 2019 Head to Head: April 13 - Danger at Blizzard. April 20 - Blizzard at Danger. 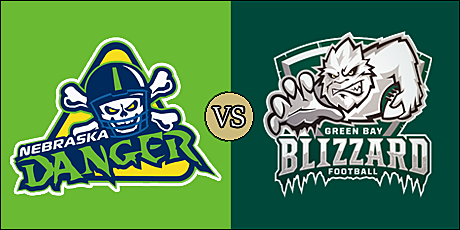 Note: The Danger are in their ninth IFL season, while the Blizzard are in their 10th. The Danger are 1-0 overall and 0-0 on the road. They are coming off a 66-44 home win over the Bismarck Bucks on February 23. The Blizzard are 1-0 overall and 0-1 at home. 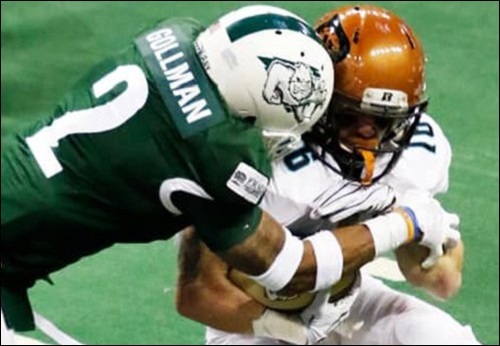 They are coming off a 51-21 home loss to the Arizona Rattlers on February 24. Danger QB Tommy Armstrong Jr.
Roster information is subject to change and is presented here as a basic guide for following the game. Rosters and team information is gathered from the IFL's 2019 Media Guide, as well as other sources, and will be updated as further roster information becomes available. Roster information is subject to change and is presented here as a basic guide for following the game. Rosters and team information is gathered from the IFL's 2019 Media Guide and other sources, and will be updated as further roster information becomes available. Two storied franchises clash in this week 2 match up. 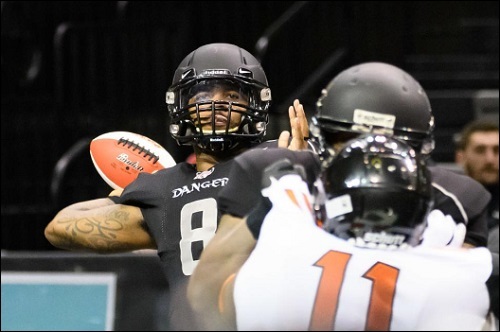 The Danger looked strong in their opening win over the Bismarck Bucks. After taking a 39-13 second quarter lead, they held off the Bucks en route to the 22-point win. The victory was Pig Brown's first win as an IFL head coach. The Blizzard struggled in their season opener against the Rattlers and will look to bounce back against the Danger. While Justin Billiot started, he was replaced by Lenorris Football in the first quarter. The latter is likely to get the call at quarterback in this one. Green Bay went just 2-12 overall last season with both wins coming over Nebraska. Judging from not only his performance on the field last week, as well as the long lines for autographs after the game, Tommy Armstrong, Jr. has quickly become a fan favorite in and around Grand Island. He completed 67 percent of his passes for 158 yards and four touchdowns, and ran for another score in the Danger's 66-44 win over visiting Bismarck. Davonte Sapp-Lynch ran wild in the game, carrying 15 times for 94 yards and a trio of scores. Returning wide receiver Eric Thomas is the primary target, having caught four balls for 58 yards and two touchdowns. Defensive backs Lavarious Varnado and Clarence Counts lead a talented backfield with the former adding an interception to his five total tackles. Defensive linemen Charles Walker and Chris Martin are ones to watch as pass rushers. As mentioned above, the Blizzard are most likely to go with Footman under center. While he struggled in the passing game last week, he made his real impact as a rusher, amassing 85 yards off 10 carries. Most of those were scrambles or designed runs out of the backfield. He also passed for 147 yards and three touchdowns, along with a pair of interceptions. B.J. Hill was slowed down in the kick return game, but made an impact as a wide receiver with five catches for 94 yards and touchdown. Kezlow Smith had three catches for 23 yards and two scores. Defensive back Marquez Gollman led the way last week with eight total tackles, a forced fumble, fumble recovery and two interceptions. Jarad Johnson also came in with eight total tackles. Defensive lineman Truett Box, who will see time as a fullback, had a sack. March 1 - Nebraska Danger (1-0) at Green Bay Blizzard (0-1), 5:05 p.m.
March 3 - Iowa Barnstormers (0-0) at Quad City Steamwheelers (1-0), 1:05 p.m.
March 3 - Cedar Rapids River Kings (0-1) at Arizona Rattlers (1-0), 2:05 p.m.
March 3 - Tucson Sugar Skulls (0-0) at San Diego Strike Force (0-1), 5:05 p.m.
All times are pacific time. Danger to kick off. Blizzard will have the ball first. Lenorris Footman starts at QB for the Blizzard. Per the announcer, there were 1,000 kids jerseys were given out at the stadium; B.J. Hill's #3 jersey. Touchdown Blizzard. Lenorris Footman 3 yard run. Cody Barber kick. Good opening drive by Green Bay. Touchdown Danger. Davonte Sapp-Lynch 5 yard run. Jerod Haynes kick. Footman is dangerous running out of the backfield. That could create problems for the Danger defense. All four touchdowns have been rushing touchdowns. Touchdown Danger. Troy Evans 4 yard run. Jerod Haynes kick failed. The Danger clearly do not want to kick off to B.J. Hill. FG Blizzard. Cody Barber 34 yards. FYI: The IFL is not supplying live statistics for this game. We will keep our own unofficial numbers and use those for scoring plays and quarter summaries. After the challenge and the penalty blocked kick by the Blizzard; Silverberry Mouhon.